Brainwash Project coming to a letterbox near you… | Do you want to help create a better magazine for teen girls? 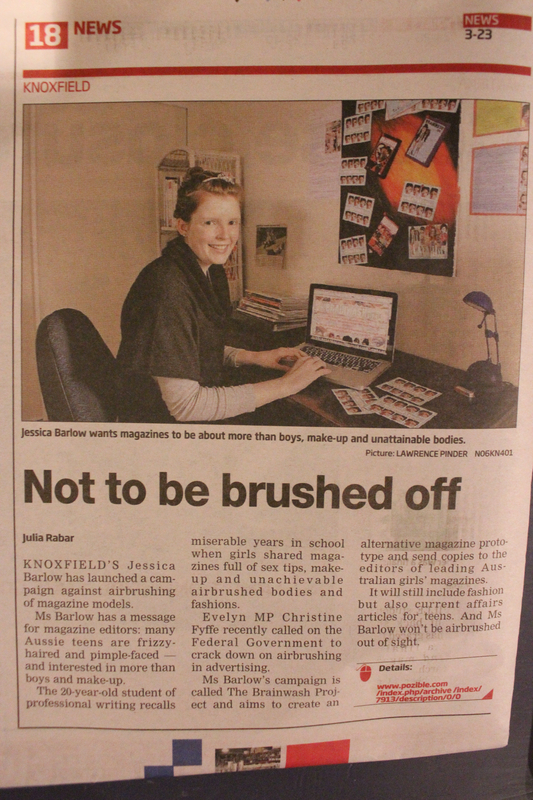 The Brainwash Project is mentioned in the print version of the Knox Leader Newspaper this week. It is being delivered to letterboxes throughout Knox – I happened to get mine a night early this week, especially exciting seeing as how I am quoted within it! So if you’re in Knox make sure to keep an eye out for it. Otherwise you can check out the article text in the online version, see my earlier blog post about that here. The fact that we have the same name, means that I’m doubled interested. Just kidding, it’s a very good cause / idea and I’d love to help out. Whenever I go to the hairdresser’s and they hand me those stack of women’s magazines, I tend to sigh, – it’s the same article over and over. And, I’ve said often how magazine’s like Cleo and Vogue are bad for your self esteem. You feel sort of washed out and unsatisfied after reading. The only magazine I’ve found some alright articles in was Marie Claire, but that seems to be aimed at older women, and the large amount of advertisements with airbrushed models can take away from the quality of the writing and message. Good luck though, I just signed the petition and if there’s anything else we can do, I’d be happy to help! Hi Jess, thanks for your comment and for signing the petition. In terms of helping out, as you know I’m looking for submissions. Otherwise if you can promote the brainwash fundraising campaign: http://www.pozible.com/brainwashproject or the facebook page: http://www.facebook.com/brainwashproject and/or the petition on your blog/facebook etc that would be an incredible help. I’m focusing on spreading the word at the moment. You’re absolutely right about the hairdressers/doctors etc. They always have the same unfulfilling magazines, it’s so frustrating that there aren’t many good alternative options in the mainstream.